Part of what I love about Yoga is that it is truly a rich subject. I, like many, began yoga for physical reasons. I had severe back pain and pursued Yoga as I did several other therapies in my effort to get better. Little did I know that years later, I would not only be able to turn to Yoga to manage my back pain, but Yoga would also be a philosophical, creative, and intellectual outlet. I was reminded of this today as I prepared to cover a Level 2 class for my Senior Teacher at Yoga Centre Toronto. 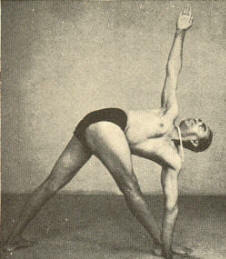 My plan was to teach a strong standing pose class with an emphasis on the Parivrtta (revolved) poses. My challenge was to deliver the teachings a) without exhausting the students (!) and b) while still providing enough of a focus that the practice did not become merely physical. I’m well aware that in my own practice if I’m struggling with a pose, taking my mind anywhere but to the struggle is quite the challenge. This is what I wanted to work with, work through, and get beyond, with these students. I remembered reading a quote from BKS Iyengar that encapsulates this idea beautifully. I looked it up and armed with the eloquent words of BKS Iyengar and his brilliant techniques for teaching, I taught the class. It was without a doubt a physically challenging class, but the students were also drawing inward. They were working inwardly and outwardly; they were evolving and involving. And in my effort to deliver this experience I was once again (in a most welcomed way) confronted by the depth, richness, and beauty of Yoga. “Body posture is important. The awareness from within of every pore of the body in the various asanas is itself meditation. It is like the turning on of millions of spiritual eyes. The mind impregnates the body and yet remains an observer; the body becomes mind and yet remains supremely alert as body. Mind and matter are fused in the dynamism of sheer energy, which is active without being spent, creative without bringing on exhaustion. The asanas are not simply important because they strengthen the nerves, lungs and other parts of body but also for their role in meditations. They are themselves vehicles of meditative action.” — in Iyengar, His Life & Work, p. 151. Do you experience asanas as ‘vehicles of meditative action’? What does this phrase mean to you? The fact that you have endeavored to work with your spinal problems has made you far more intelligent in the subject than those who do not have spinal problems. Your observation that the same “action” does not feel the “same” in every asana is astute. A nice Bharadvajasana twist done like it is in the first syllabus is far different than that of Parivrtta Trikonasana even though they are the same “actions.” I can see why your mentoring teacher feels comfortable leaving her students in your hands!